I used to think that apple cinnamon oatmeal came in a packet. It never occurred to me that you could easily make it homemade with a recipe. Thankfully times have changed and I have learned to skip those packets with all the added sugars. You will need some whole grain oats – I use Quaker Old Fashioned. 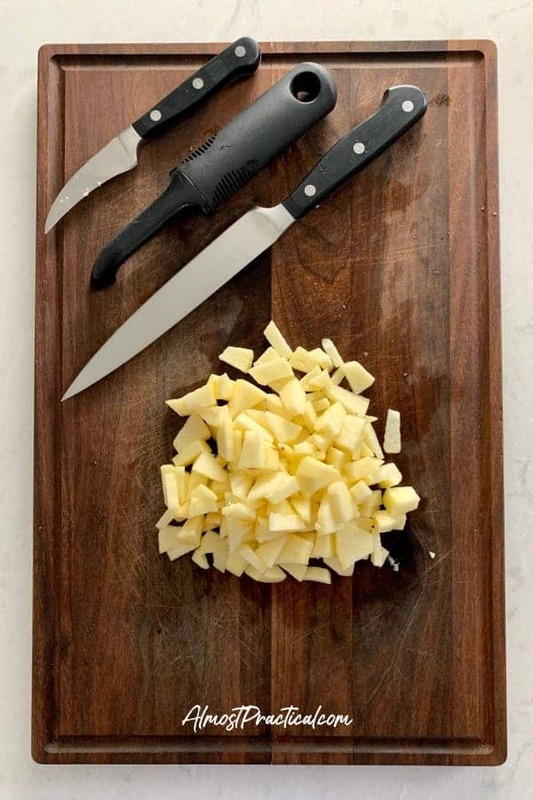 I get a lot of questions about that curved knife and my cutting board – both of which I feature in quite a few of my recipes. The curved knife is actually a Wusthoff peeling knife, which I love to pieces. I don't actually use it for peeling, although it does peel quite well. I use it to easily cut the core out of my apple. I simply peel the apple with my OXO peeler, while the apple is whole. Then I cut the apple into quarters vertically – which exposes the core. Finally I cut the core out with my Wusthoff peeling knife. You could use a straight knife for this like the one also pictured above – but I find that the straight knife cuts away a lot of the fruit, too. The peeling knife on the other hand, sort of follows the curve of the fruit. 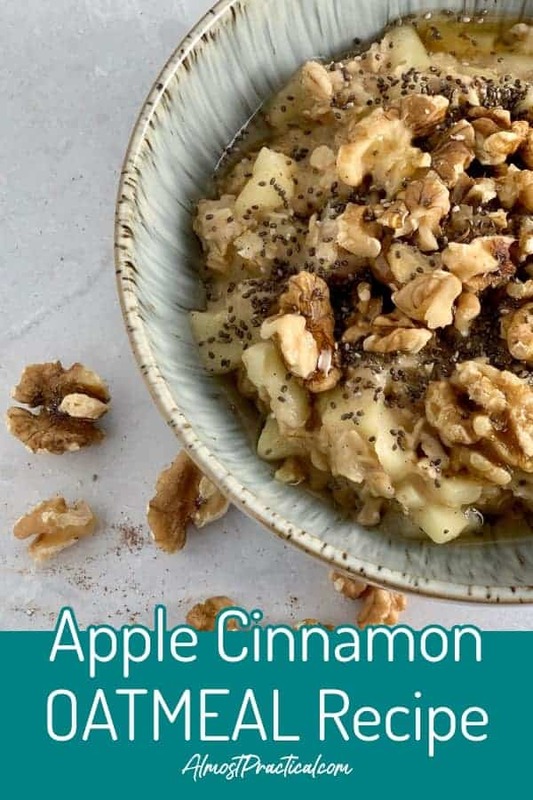 This brings me to the next step in this homemade apple cinnamon oatmeal recipe. Peel and coarsely chop the apple. 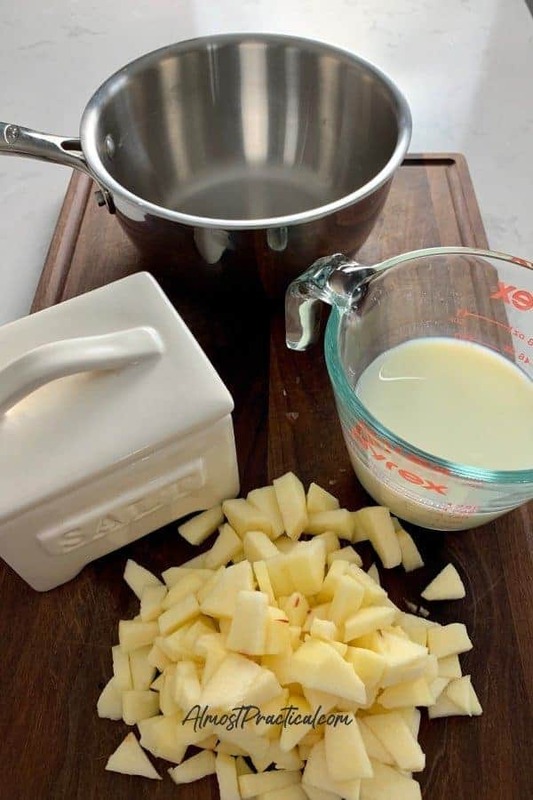 In a small saucepan mix the fat free milk, a pinch of salt, and the chopped apple. If you are looking for some reasonable priced tri-ply stainless steel pots – check this OXO set out (the small saucepan is pictured below). Who knew that OXO made pots and pans? 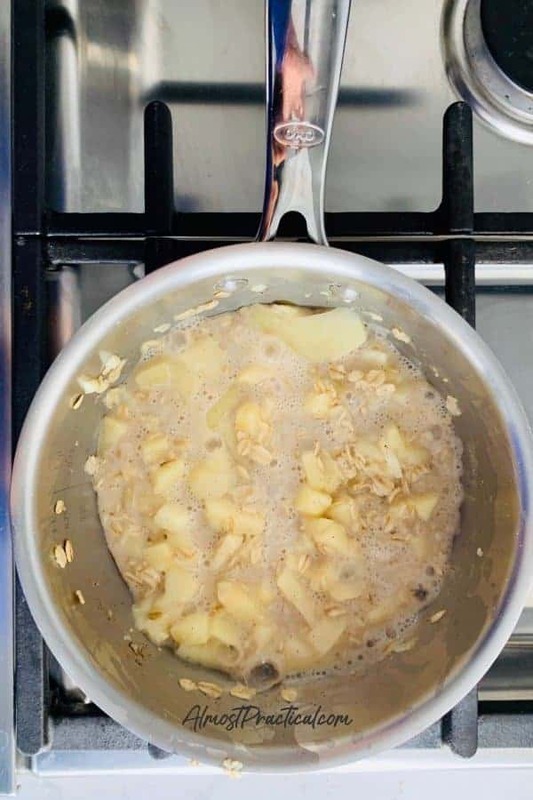 Now this step is REALLY important – place the pan on medium heat and stir the apples and milk until it just starts to bubble on the sides. Don't let it fully boil or get too hot because the milk will separate (ask me how I know). When it just starts to bubble, add in the oats and the cinnamon. Cook for 5 minutes while stirring constantly. During this 5 minute cook time, you can keep the stove on medium heat until the sides start to bubble again, then turn the heat down slightly. When the oatmeal is ready, put it in your bowl. 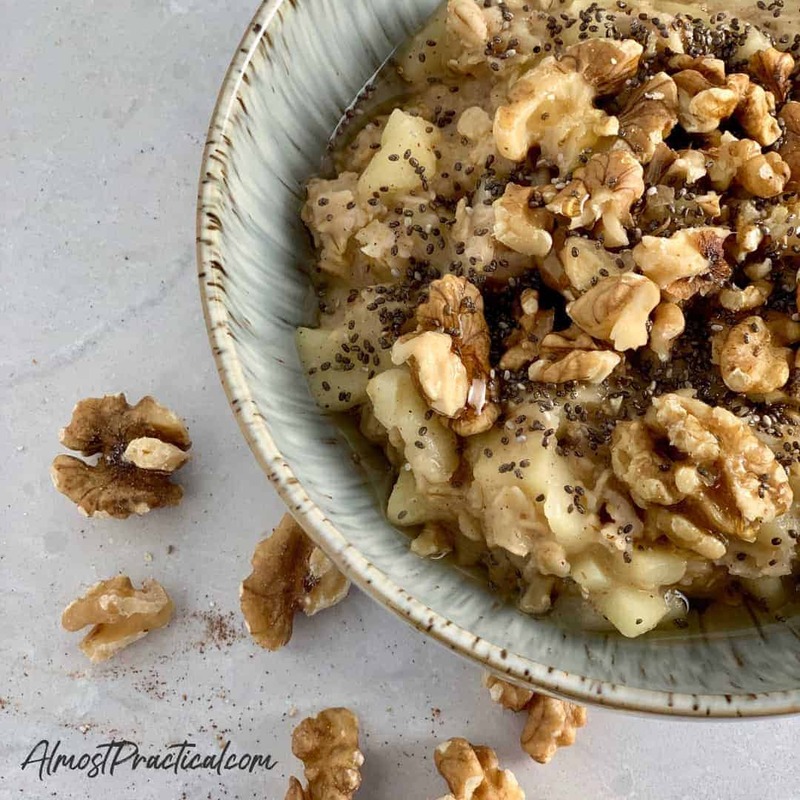 Sprinkle some chia seeds and walnuts on top – the quantity is entirely up to you. Make it how you like it. 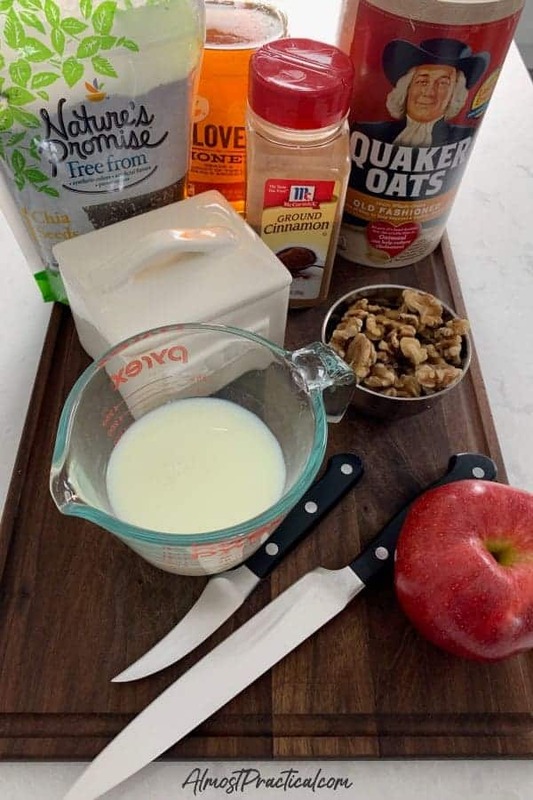 You may have noticed that we have not added anything sweet yet to this homemade apple cinnamon oatmeal recipe. Remember that the apple itself is pretty sweet – the actual level of sweetness will vary depending on the variety of apple that you used. Gala apples tend to be sweeter whereas Granny Smith apples tend more towards the sour. I typically just add a drizzle of honey over the top and it tastes great for me. If you are unsure, taste the oatmeal for sweetness and then decide how much honey to add. This homemade apple cinnamon oatmeal recipe makes a great hot breakfast any time of year. Oh – and in case you were wondering – that really cool bowl in the photo above is from the Denby Speckled Halo Collection. Add milk, pinch of salt, and chopped apples to a small saucepan. Cook for 5 minutes stirring constantly. During this 5 minutes start with heat at medium, but reduce heat a bit when sides start to bubble. 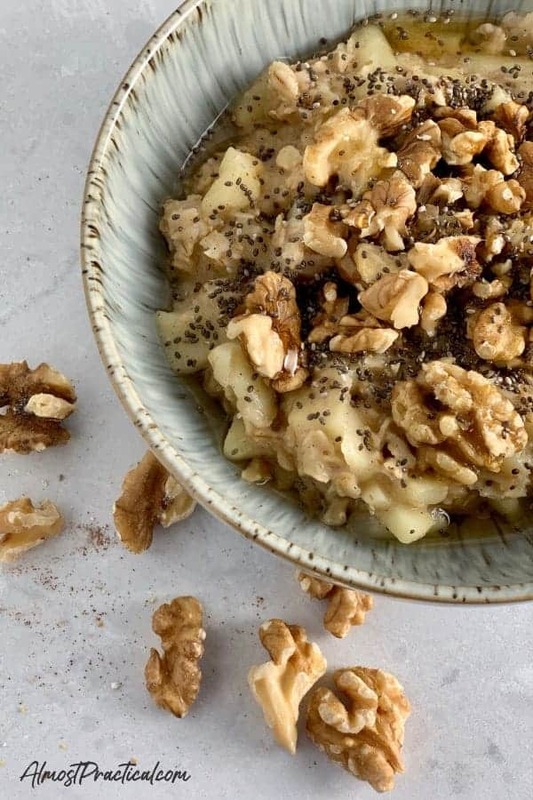 Transfer the cooked apple cinnamon oatmeal to a bowl and garnish with a sprinkle of chia seeds, some walnuts, and a drizzle of honey.